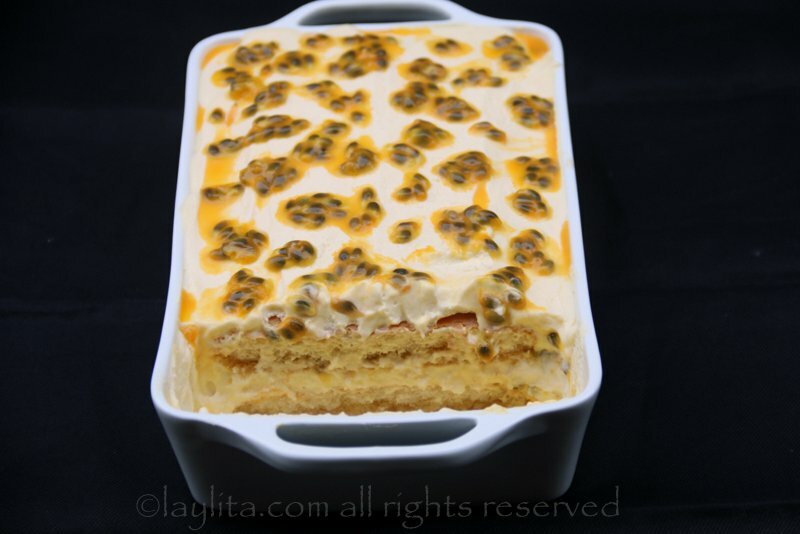 I experimented with passion fruit tiramisu last year and even the initial experiment was so successful that I never got a chance to take pictures. So, when I was in Ecuador this summer, and had unlimited access to one of my favorite fruits, maracuya o passion fruit, I had to make it there. At first I wasn’t sure that I would be able to find mascarpone, but luckily enough they do sell at Supermaxi (they keep in the section with the specialty cheeses, and if you don’t see it ask someone to check if they have more in the back). 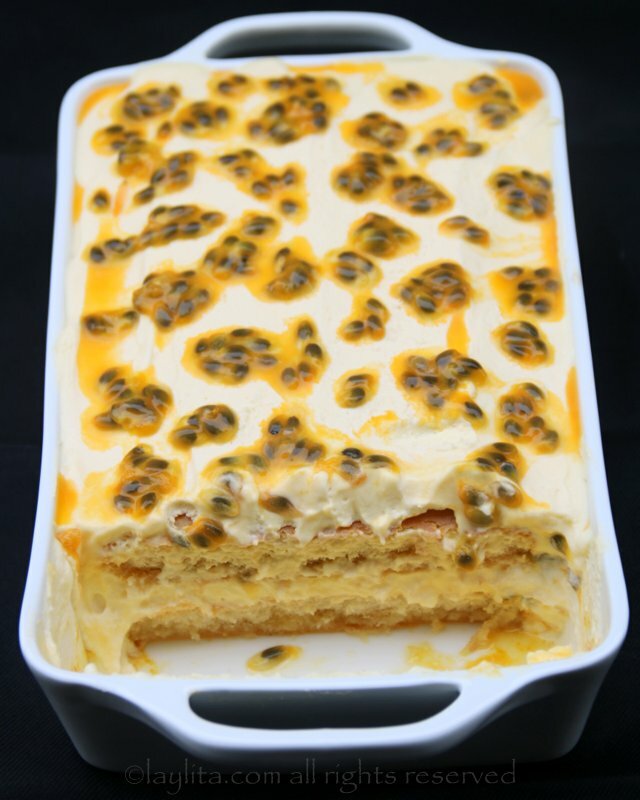 The concept of making passion fruit tiramisu is very simple, the process is the same as making traditional tiramisu, just replace the espresso coffee with passion fruit concentrate – and instead of garnishing with chocolate shavings use fresh passion fruit pulp. 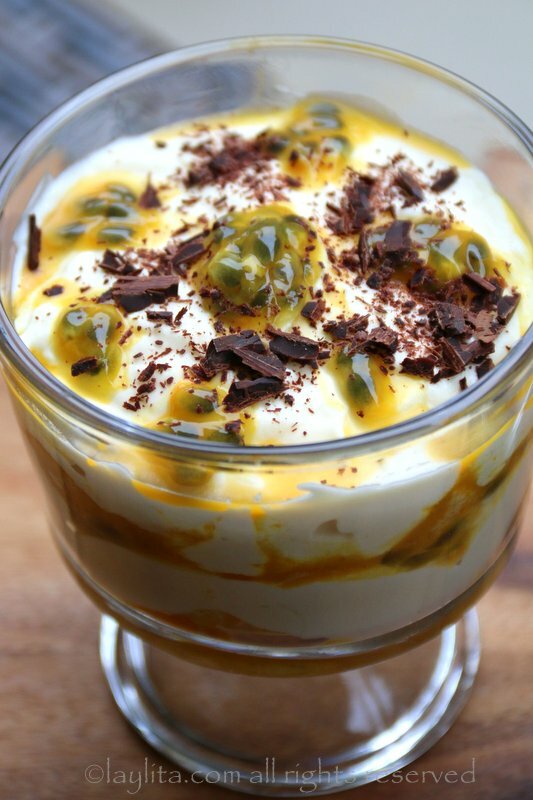 Or garnish with both passion fruit pulp + chocolate shavings (that combination works great). 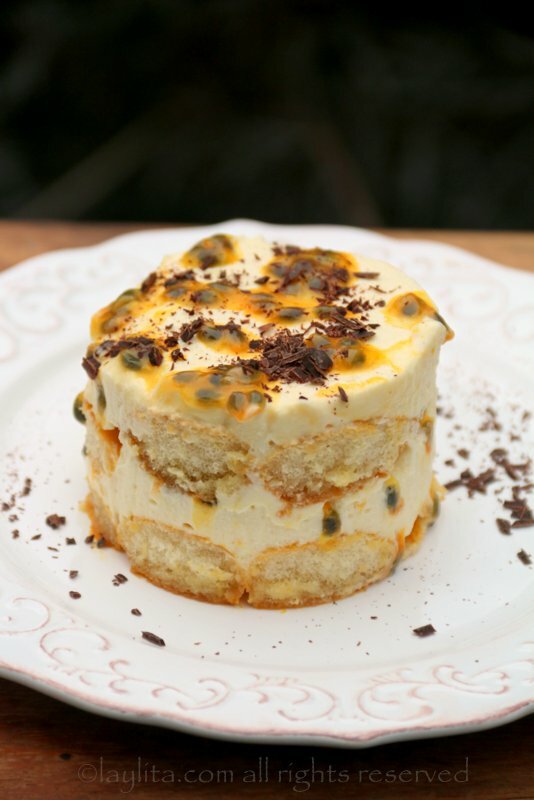 Passion fruit tiramisu recipe made with mascarpone, ladyfingers, eggs, sugar, rum and passion fruit. In a medium size bowl, beat the egg yolks with the sugar and rum until foamy. 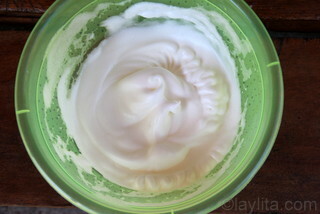 In another bowl, beat the egg whites until they become fluffy and stiff. 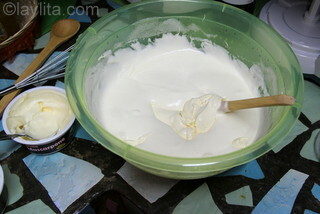 Add the mascarpone cheese to the egg whites; use a spoon to gently fold in the mascarpone. 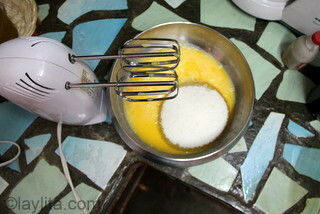 Use a spoon to gently stir in the egg yolk and sugar mix. 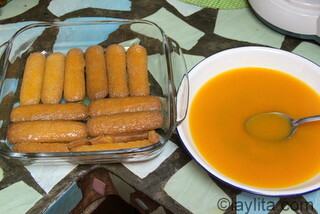 Dip each ladyfinger into the passion fruit concentrate until well moistened but not soggy. 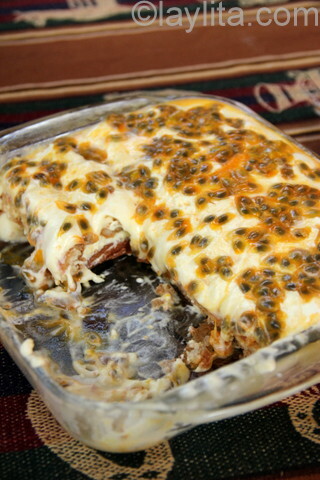 Place the passion fruit dipped ladyfingers in a square or rectangle serving dish until you have a full layer of ladyfingers – if needed cut some of them in half or to the right size so that the entire bottom of the dish is covered. 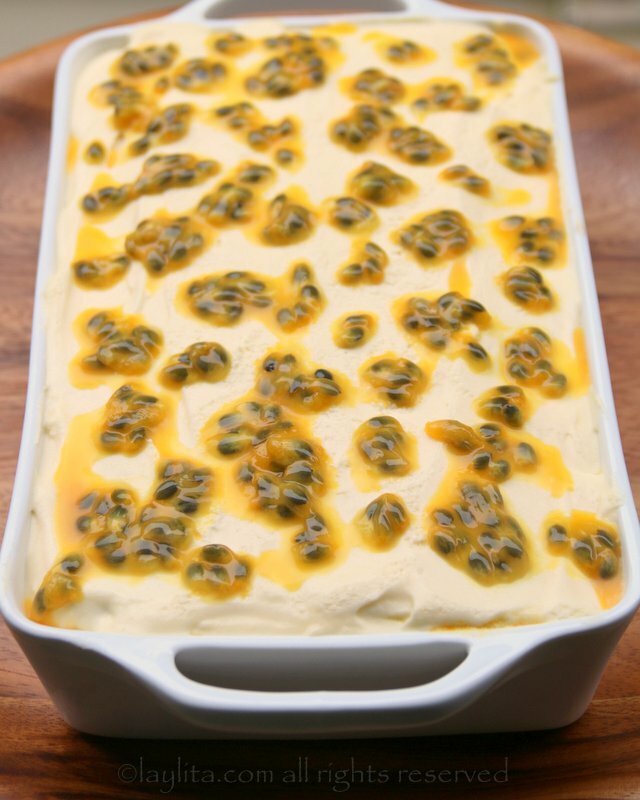 Cover the passion fruit dipped ladyfingers with the mascarpone mixture cream and some fresh passion fruit pulp (if you have enough fresh fruit – if not save for the topping). 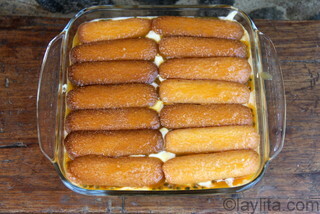 Top with another layer of passion fruit dipped ladyfingers. 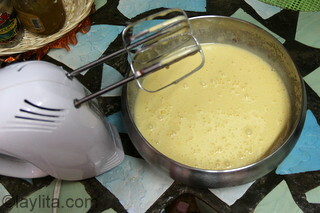 Finish with a final layer of mascarpone mixture. Refrigerate the tiramisu for at least 6 hours, overnight is ideal. 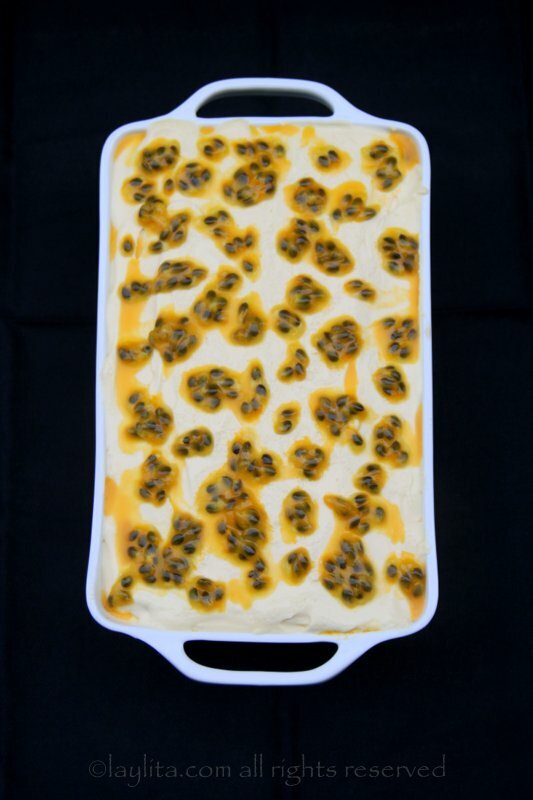 Spoon the fresh passion fruit pulp over the tiramisu right before serving. In the US, it’s not so hard to find frozen passion fruit concentrate at most Latin grocery stores at a reasonable price. You can also find fresh passion fruits at some specialty supermarkets, however they are the smaller purple variety, which has less pulp than the larger yellow ones we are used to in Latin America, and the prices are super high. 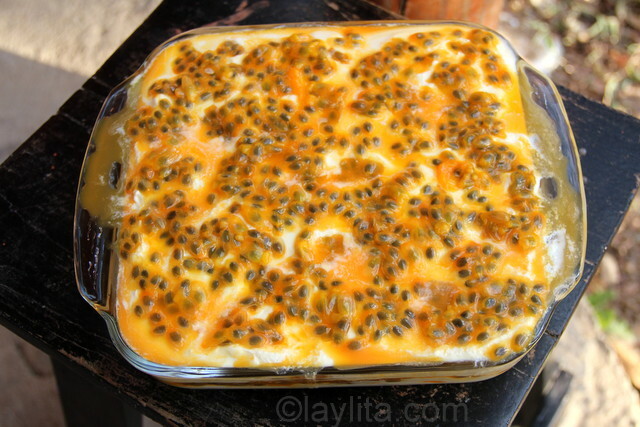 If you are making this dessert in the US, my recommendation is to use the frozen concentrate for dipping the ladyfingers and if you can afford it buy a couple of fresh fruits just to garnish. If you live somewhere where you don’t have trouble finding fresh passion fruits, then also add some fresh pulp in between the layers of mascarpone and ladyfingers. Something else I learned while making this version of tiramisu is that when you make it with coffee you have to dip the ladyfingers very quickly into the coffee to prevent them from getting too soggy. 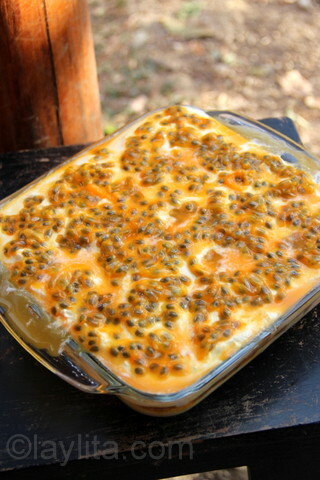 However, for this passion fruit recipe, the ladyfingers don’t absorb the passion fruit concentrate as quickly, so you need to give them more time to soak in the liquid or they will be too dry. 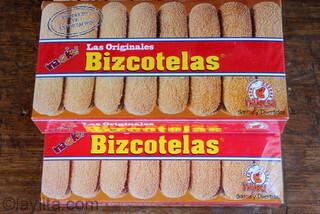 The Ecuadorian brand of ladyfingers is called Bizcotelas, which means ladyfingers. These ladyfingers are somewhat flatter and not as evenly shaped as the ones in the US – it had been a while since I had them. For those of you that recognize the red box they come in I’m sure it will bring some nostalgic moments. One of which might be the memory of a civic/religious/celebratory event where you were given a coupe style glass of champagne (probably Grand Duval) and the must have bizcotela to go with it. 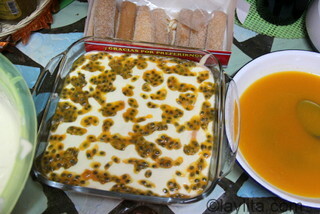 In Ecuador, I made this passion fruit tiramisu as a dessert for a BBQ party at my brother’s place. It was also very successful, though this time I was able to enforce the “no one touches this dessert until I take pictures” policy, but with hungry people staring at me, I had to act quickly so this one of the quickest food photo sessions ever. 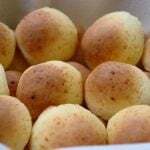 I want to make it again soon, but I am still recovering from being somewhere where I could 5-10 passion fruits for $1, to paying $4.99 for one that is half the size in the US. The quantities in this recipe are for 8-10 people (even though about 20 people showed up to my brother’s party). 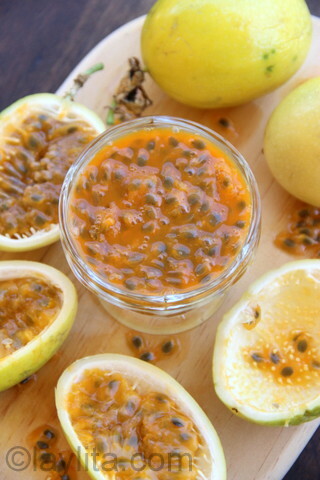 Where do you find fresh passion fruit in Florida? I’ve been wanting to make this but I only found frozen pulp. Did anyone try it with pulp? I’ve made it with the frozen pulp before (just taste it and make sure it’s good, sometimes the frozen ones can be off if they de-frosted and were frozen again during transport) – and just used a few (very expensive) fresh fruits for the decoration/garnish. Your blog is the best! Please do not ever stop posting!!!! 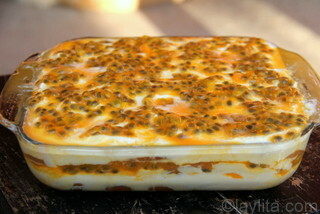 Thank you and the desert (as per your recipe) was so tasty with passion fruit from my garden. My family loves it. I am so impressed. 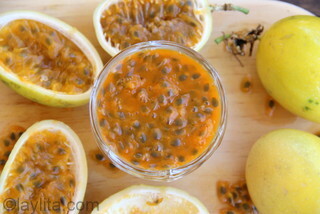 I wish I could get fresh passion fruit in New York and if i do find its extreme. I can only find the pulp and frozen….so I make daquiris. 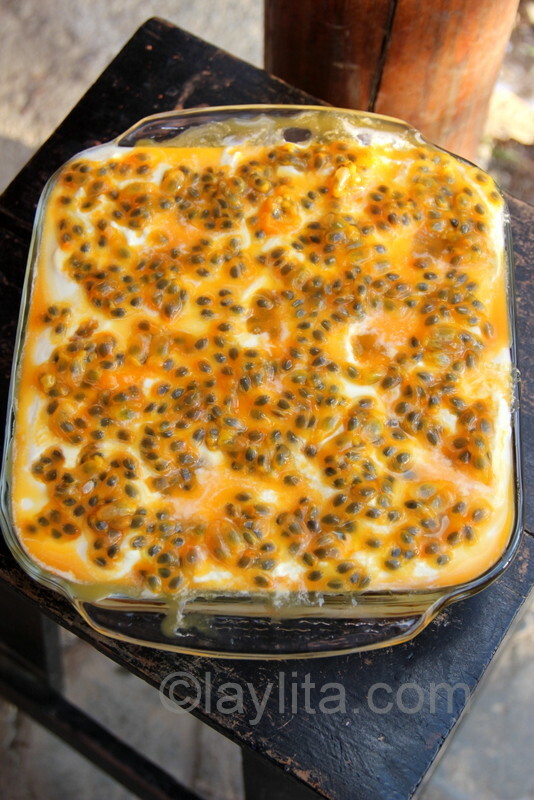 In Costa Rica I will have to make my own lady fingers and drive five hours to get mascarpone, but the passion fruit will be easy to get at a great price when they are in season! Great job! I have ventured as you have… To me, (and just me) there is no better pairing for chocolate than passion fruit (with all due respect to raspberries, blackberries or strawberries). I have done almost the same as you, but added a dark chocolate ganache layer. 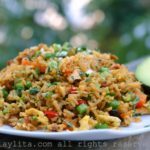 People go CRAZY with the explosion of flavors on the palate! this looks SO GOOD!!! i am going to manta tomorrow and will certainly get the ingredients from supermaxi!!! 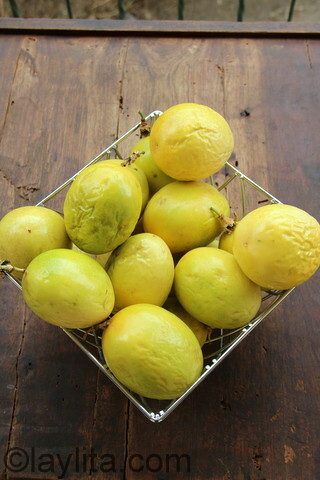 i don’t think that most people here realize how lucky we are to buy ten maracuya for a dollar.. in fact where i live in the campo, they are 20 for a dollar when in season!!!! the price in the usa was shocking 5 dollars for one! thanks again for a wonderful recipe!